This Super 7 based road rocket is damn scary. Two hundred and forty six horsepwer at the wheels from 5.7-litres of LS1 power in a car weighing around 900kg is going to make your eyes widen as you squeeze the throttle, let us tell you! Mash the pedal to the floor and bitumen is dispersed underneath faster than your brain can keep up. 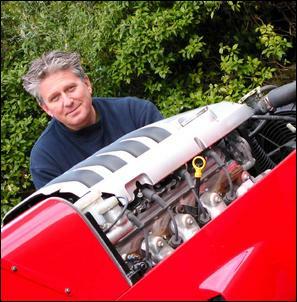 Mike Moore started his working life as an electrician, but always had a hankering for performance cars. 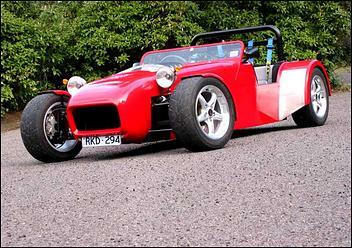 While working in the UK, Mike reckons he "built about 20 cars", mostly as projects for himself and other people. He then moved into the hi-fi business, but lost interest in that. He swears he "was never in the car business", but always had a spanner in hand in his spare time working on something. It was when he was approached to build a Super 7 based car for a customer that the idea for Daytona Motors and the X7 car was born. His customer wanted a replica, and Mike set about looking for an appropriate power plant. The SR20 turbo engine (found in the Nissan 200SX) was one of the choices. 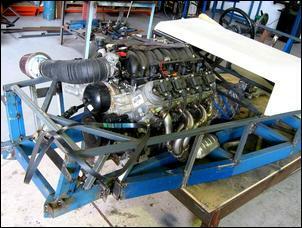 In looking at the SR20 though, Mike and co realised that a better option that could be found. He felt that getting decent modified power from an SR20 meant a loss of everyday driveability (thanks to a peaky output), sacrifice in reliability and fuel economy and a weight disadvantage with a front mount intercooler and its plumbing. For only 40kg more Mike could source a new LS1 engine from a Camaro in the US. With no modifications over standard, the car would have excellent drivability, low noise, great power and could be emissions approved! Eagle Spares had a number of new LS1 Camaro engines, and they came complete with the factory Camaro PCM. For about AUD$6000 each, the decision was made. Starting with the basic chassis and design, Mike and his customer initially started looking to the UK for some cheaper turn-key solutions. His first chassis design was built using some plans from the UK, and consisted of 1-inch square tubing and designed to house a 4-cylinder engine. Mike and his business partner soon discovered that this chassis was in no way strong enough, as it flexed too easily (two men could hold it at either end and visibly twist it!). Chassis number two was mostly new, retaining only the perimeter rails of the previous chassis. 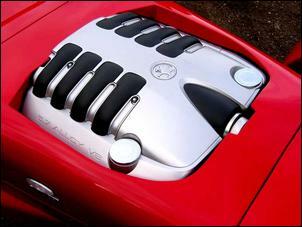 Four crossmembers were located in the body with additional diagonal bracing to prepare for some proper V8 torque. 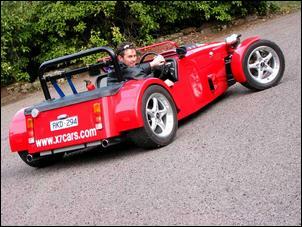 Aside from the perimeter rails, the rest of the body was manufactured using 75x25mm steel tubing. But this chassis was still nowhere strong enough to house an LS1. The two centre rails were removed and replaced with two 88mm diameter steel tubes. The cross members were then scalloped to allow them to be welded to the centre rails. 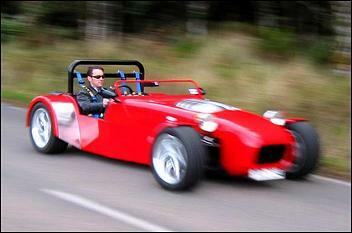 This chassis was built as a rolling shell, and some shakedowns were done. "The chassis was probably strong enough," states Mike, but producing bracing and cross members for future cars that had to be scalloped and welded to round centre rails was a pain, so they were replaced with 100x50mm rectangular steel tubing. Stronger and heavier, the fourth chassis passed the test! An added bonus was the extra flexibility allowed for exhaust location - the pipes were sandwiched between the floor and bottom of chassis. But what about the weight penalty of the extra strength? "That is easily outweighed by the awesome handling afforded by the stiffer chassis, and the ability to mount the V8," says Mike. During the build process, everything to complete the car - including the custom pedal box, driveline and two thirds of the exhaust - can be loaded into the chassis from above, making a rolling shell project easier. Upper and lower suspension control arms were manufactured by Mike. Modified uprights hold VT Commodore hubs and calipers, with 296mm DBA rotors up front using EBC pads. Why VT front brakes? "I have them on my own Commodore and they work great. Harrops are another $10,000 expense for the car, and really weren't required as the car only weighs about 870kg and the brakes work extremely well as they are." 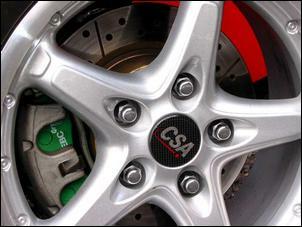 Rear brakes are stock VN Commodore disc units. Daytona Motors' machine workshop also produce the steel milled steering column, which is mated to a VR/VS Commodore power steering rack and housing. The steering arms have been shortened some 30 per cent from the Commodore items, to 90mm. This effectively compensates for the lighter power steering effort required, giving the steering good weight without need for recalibration. Yes that's right, this car has power steering... pretty rare for a car of this sort! The wheel can only be turned 1.9 turns lock to lock "for nice sharp turn-in and control" and the rack still maintains its variable sensitivity. The standard LS1 power steering pump is retained and used. Bodywork is fibreglass, with the moulds all hand prepared by Daytona Motors. Apparently after working with craftwood, aluminium and bog for the nose, Mike and the guys discovered the wonders of polystyrene! Ahh.. that's better. The rest of the panel moulds were quickly prepared, and a fibreglasser took care of the rest. 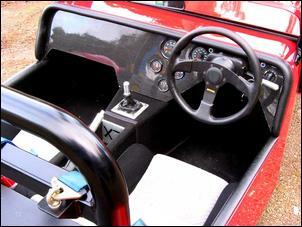 As expected, the interior is fairly sparse, but includes a set of the electronic VDO Cockpit Vision gauges including speedo, tacho, oil pressure and water temperature. Seats are carved foam, and if you look carefully you might notice some interior trim treatment courtesy of a VK Calais! A small but steeply raked windshield sits in front of the driver, offering little protection from bugs. Why a steep rake? "We didn't do any aerodynamic testing - it's essentially a box on wheels, so we raked the shield back a bit!" 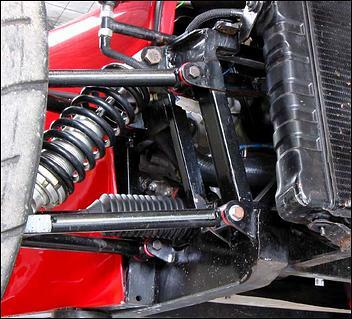 The typical Super 7 four-link plus Panhard rod rear suspension setup is used, with independent coil-over front suspension. Wheelbase is 2450mm, 110mm longer than the typical Super 7 wheelbase. The rear differential is a modified VN commodore circa 1992, with 3.9 LSD centre. Getting the LS1 engine running properly in the car was no easy task. Finding out how to bypass the PCM ignition key authentication proved quite a headache, for example. Essentially, without the BCM (Body Control Module), Interface Module and dash components, the engines will not work with a 'wrong' key. Of course, for your LS1 powered car in the garage this sort of security is pretty good, and required for reasonable insurance rates. 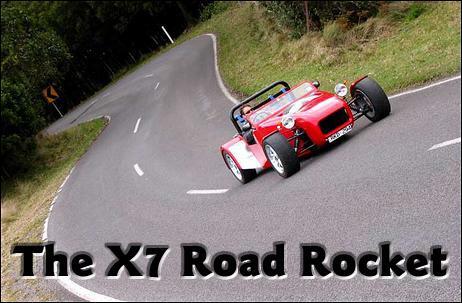 But in a kit car like the X7 this caused a problem. Without an original key, Mike had to find a way to bypass the key authentication. After a procession of phone calls, discussions and a lot of head scratching, he eventually discovered a company ('Street and Performance') in Arkansas that could supply him with a plug-in module to fool the computer into running the engine, negating the need for a BCM and interface module. It was no surprise that this company had in their employment an ex-GM worker who happened to have worked on this technology during its original development! The module was sent over, and as luck would have it, the engine started first time the module was used. Exhaust is twin 2¼-inch flowing into a 'two-in, two-out' centre muffler which acts as a muffler and balancer. Mike admits there wasn't much research done as far as the exhaust goes, so a few more horses could be extracted there with some experimentation. With the catalytic converters 'factory' distance from the engine front pipe, it got an OK as far as emissions compliance goes. Exhaust noise level measured is a miserly 86db, well down on the 89db limit. With the driveline in the car, it was rolled onto a Dyno Dynamics dyno and the 5.7-litre pumped out (with a "special program" from Brocky and his GM engineer) 221hp. But the Camaro computer supplied with the engine produced a much healthier 246hp at the wheels, on this dyno working out to approximately 255kW at the flywheel. Compare this to the local 225kW 5.7-litre mule, and the Camaro cast iron manifold (no extractors!) and computer program certainly raises an eyebrow. Gearbox is a T56 6 speed box, imported from the US - most likely also from a Camaro. So what's performance like? Nought to 100 klicks comes up in around 4.5 seconds, accompanied by a cloud of smoke from the sticky Bridgestone Potenza 540 tyres. A rolling start has seen the little rocket outrun a GSXR 1100 motorbike, and a ZX9 Kawasaki road bike from a standing start. This thing takes off like a cut cat on carpet, and just keeps on going. All this performance, and a claimed 7L/100km around town to boot! Mike is currently working on some improvements in the car, including lowering the seating position, which will not only have the benefit of producing a lower centre of gravity, but thanks to the configurational change allow the fitment of some extractors to the exhaust system. So what will one of these cars set you back? An unpainted, untrimmed X7, with that lovely looking LS1 engine just visible in the nose, will set you back about AUD $55-60,000, depending on options. And for that money you get a fully engineered road going race car, with most components brand new. What a blast. Get ready for lift off!